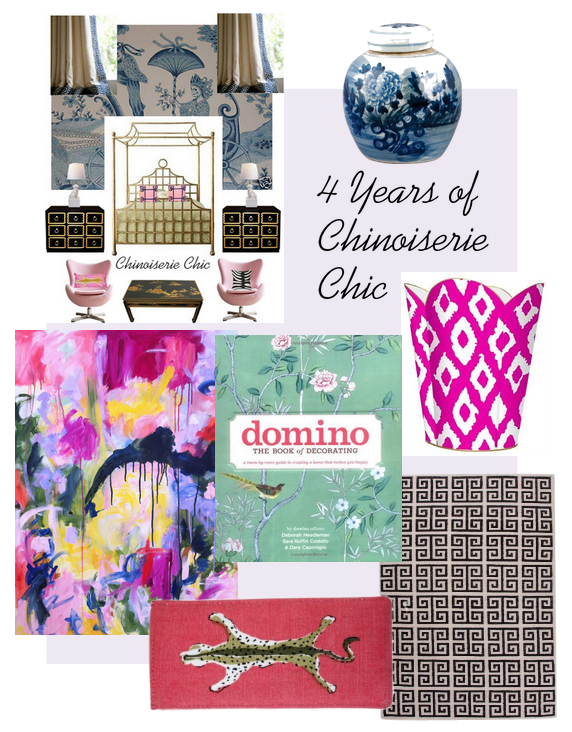 Thanks for participating and for four fun and fabulous years of Chinoiserie with 2,340 posts and much more to come! Congratulations on 4 years! I love Chinoiserie Chic! Happy Blog anniversary, Beth! I have enjoyed your blog since I started blogging over three years ago. Great giveaway! Please put my name in hte hat! Here is to hoping the 3rd time is the charm! I was introduced to the Pink Pagoda and Kerry through your blog and have purchased prints and a lovely dragon planter from Jennifer and a great painting from Kerry. I am definitely coveting a dining table and chairs from Charlotte and Ivy and a decoupaged wastepaper basket from Marye Kelley. Congratulations! Love your blog! Especially the inspiration boards. I am following you on Pinterest. Would love a chair from Charlotte & Ivy. Love your blog, hope to send you some pictures of my Chinoiserie pieces from my home sometime. Here's to another great four years! I follow you on Pinterest as well as your lovely daughter, Kate! I would love the blue and white jar to add to my small collection. Awesome giveaway, I would love to win any of these items! Congratulations Beth! What a great giveaway! Have a lovely weekend. I follow you on Pinterest! and I follow all your lovely ladies in the giveaway, too! I have just discovered you and I love it! I love this blog, and now you have one of the best giveaways I've seen! I would be beyond thrilled to win this one! Thanks. From the Pink Pagoda I would love to have the green greek key pillow and the kelly green, black and white cheveron pillow...I love green. Is it cheating to say that the thing I want most from The Pink Pagoda is the blue-and-white cell phone cover? I'm obsessed with it! I am loving the - Blue and White Greek Key Pillow from the Pink Pagoda. 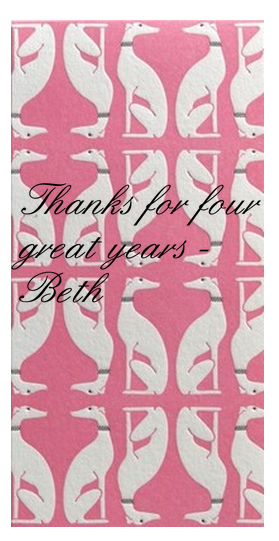 Thanks and congrats on your blog anniversary, Beth! Have enjoyed emailing with you during my renovation. I would be delighted to win anything. But we win every day reading Chinoiserie Chic! I follow on Pinterest! Such a lovely giveaway! What a generous give-back to your readers! Happy Anniversary! Congratulations Beth on your four year anniversary! Chinoiserie Chic is “double happiness” for your blog readers, with Chinoiserie images you share from sources across the globe, and your beautiful home. I read your blog daily and follow you on Pinterest. Here's my second entry. Spend most of the morning looking at the beautiful sites and their amazing items. I want to redecorate my entire home. Love the B&W vases on Navy prints at Pink Pagoda. Kerry Steele's art is fabulous. Walking King Street is one of my favs. Love the greek key rugs at Charlotte & Ivy. Marye-Kelley: love the tissue boxes and wastebaskets. I love that I know that every morning there will be something new and so chinoiserie on your site. Congratulations on 4 beautiful years! I follow you and your daughter on Pinterest! Would love the set of 8 giclee ginger jar prints from Pink Pagoda for my living room. I need a gallery wall! I would love the black and gold Asian toile tissue box cover from Marye-Kelley. I love this! Happy Anniversary! I think the grande ikat gold waste basket would look amazing in my powder room redesign. Way to go!!! Four great years!! !Wish I had known about your blog before 6 months ago. Love the daily dose of chinoiserie!!! !kathy b. Of course I follow you on Pintrest- love all you do!!! kathy b.
Congratulations and Happy Blogiversary :) I love following you on Bloglovin and on Pinterest. I would love to get a blue & white ginger jar from Pink Pagoda for my mother's collection. It would be a perfect Mother's Day gift! Thank you for providing inspiration! Wishing you many more years of success! And,yes, I follow you on Pinterest! Favs from your sponsors but I love everything they do!! I love Pink Pagoda! Such a cool and inspiring site!! kerry steele - garden folly emerald fabric. pink pagoda - blue and white conton ginger jar. charlotte & ivy - bold ikat weave blue rug. marye kelly - leopard/zebra/monkey wastebasket. Congrats on your 4 years! Extraordinary! Congratulations on four years and I hope there are many more to come! I love all of the stores participating in this giveaway, but most of all would love one of Kerry Steele's lovely works to display in my home! Your blog is the first item on my favorites list and I love that you post everyday. You have inspired me to add chinoiserie touches to several rooms. Beth I am stunned beyond at your generosity. Also you have picked some of my very favorite sponsors! I do follow you on Pinterest! Great boards! Amazing giveaway! Congrats on 4 years! I would love any of the Pin Pagoda's ginger jars! I would love any of the fabrics from Kerry Steele. A lether chesterfield sofe from Charlottee & Ivy would be amazing! And I'd love a personalized clipboard from Marye-Kelley! My second comment -I posted a link to Mayre-Kelley on my face book page so all my sorority sisters can see their nice Greek letter decoupaged gift items. Beth such a difficult decision! I have wanted the lidded jar with bird and flower from Jennifer. Also the Pansies Redux from Kerry really says springtime to me!I think the painting would come first right now. Thank you a million times for your blog! I so appreciate all of your ideas and everything you show us! Love your blog. I am following you on Pinterest. What a wonderful give away! I learned about it from the pink pagoda. I'm happy to follow you on bloglovin! Cheers and Congrats on 4 years! I'm now following you on Pinterest. You have some great boards! I'll take anything blue and white from the Pink Pagoda. She stocks the most incredible stuff! And I wouldn't mind winning a new domino book. When I purchased mine eons ago i didn't realize that it was missing a chunk of 20 pages. I'd love to finally find out what's on those missing pages!! Congrats on your anniversary! What a great giveaway!! Following you on Pinterest now! Beautiful boards! Thanks for making my Pinterest experience so awesome too! Congrats on 4 years! Loving your site. It's mesmerizing! Beth- I found a beautiful octagonal planter on The Pink Pagoda- although all of her blue and white is amazing! Best of luck for another 4 years! Have a great weekend. Omg, I am in love with Charlotte & Ivy's poeme laval rug runner. I might need two... Fingers crossed! Pink Pagoda ~ love it all, but the octagonal planter really caught my eye. Kerry Steele ~ beautiful offerings all. The Alice in Wonderland fabrics would be fun for a party. Charlotte and Ivy ~ makes me want to redo my living room. Wonderful pieces of furniture. Love the white Newport compote! Marye-Kelley ~ love her selection of decoupage plates, especially the red tulips. You have such a wonderful blog! Thanks for helping me define my style better. Congratulations on 4 years! Love your blog, although it causes home envy quite frequently. The greyhouse pink background on your car is gorgeous. Congratualations, and many returns. Happy anniversary. I subscribe to the blog. Happy anniversary! I follow on Pinterest. Wow, what a fantastic giveaway!! Thanks for all your posts, Beth! ....and I would pick a ginger jar from The Pink Pagoda, another regular blog read. Such a great giveaway! Congrats on 4 years of blogging. Happy Anniversary! I follow your blog religiously and your Pinterest too!! All the best! Woops guess I don't follow directions well! I follow you on Pinterest too! I would love that pink ikat wastebasket from Marye-Kelley! An octagonal planter from pink pagoda! The gorgeous old pagoda mirror from Charlotte and Ivy!! Happy Anniversary! I'm from Alexandria, live in Hong Kong and adore Chinoiserie, art, decorating and travel. Your blog is ful of great ideas always! Love the I trod unction to Kerry Steele's art, she's terrific! Keep up the great work! I follow CC, I follow on Pinterest. Love your blog! Pick me! Pick me! I would love Kerry Steele's "pansy redux". happy to follow you on pinterest! I'd adore a Red and Pink Greek Key pillow from Pink Pagoda! Thanks for all of the gorgeousness and congratulations. I have been a lover of chinoiserie since I was in my teens and I love your blog. I love the octagonal planter from The Pink Pagoda. I used to have one and at some point in time it either got broken or lost in a move. Congratulations on your blog anniversary and thank you for such a generous giveaway! I moved to DC from Singapore 3 years ago and was selling my Chinoiserie stuff thinking that it was too de trop and I discovered your blog and how so many seemed to love Asian things. I've held on to them and through ideas from your blog, increased my collection of all things Chinoiserie! Thank you! A huge congratulations to you on a job well done......love your blog and wonderful chinoiserie style. I am excited to now be following you on Pinterest..another thing to keep me planted in this seat...lol. Wishing you many more years of blogging bliss and woudl love the chance to win any one of your wonderful giveaways! Congratulations! Love my daily dose of Chinoiserie Chic! Oops, I forgot to say I am following you....yay! So happy to have found you on pinterest. Happy anniversary! Thanks for all of the inspiration! Love, love, love the blue and white porcelain at The Pink Pagoda. Sooo hard to choose one, but I think the octagon planter is so unusual. But also loving the canton ginger jar...hmm mm. I am LOVING the porcelain landscape jars at Charlotte & Ivy. I could go on and on....the foo dogs are amazing, the chairs are swoon worthy!.... LOVE! I just checked out your pinterest boards and started following you! I can't wait to dive in to all things chinoiserie! We are kindred spirits! Your blog is amazing! Congratulations on your anniversary! Cheers! Kerry Steele Fine Art: "Into Elan" * "Dilettante social" * "The chandelier I swing from..." I definitely covet her work-stunning! Pink Pagoda: Loving ALL of the elephant and monkey prints! And the porcelain is beautiful..Blue and White Jar with Bird and Flower and the Blue and White Jar with Figurines are my Favorites. The Tangerine Indian Paisley iPhone case is FUN! Marye-Kelley : Tri Delta treasures for my Daughter and the Holiday Plates-so fabulous-I may need to build a collection-1 for each holiday! Thank you for introducing me to fantastic new web stores! love chinoiserie Chic...always brightens my day! loving the vases at Pink Pagoda! perfect! Wow...could do my entire house and more from these amazing sites! Just found your blog! Amazing! Congrats on your anniversary! Happy Anniversary Beth, love your blog! Happy Anniversary! Your blog was my introduction to the world of blogging! What a delightful education it has been. I love your blog. When I found it, I knew I found a kindred spirit. Congrats on 4 years. I look forward to many happy days enjoying your posts. Cheers to four, fab, chic years!! May there be many more to come!! Can even imagine if I won....LOVE it all!!! Happy anniversary. Here's to as many more as you desire. Love your blog! So many beautiful things! I would love to win something!! Such a lovely giveaway to mark this momentous milestone! All the best to you, always! Yes, I am a long-time follower of yours on Pinterest! Kerry Steele's art is to die for! I am crazy for the piece you used in today's board! Congratulations of your four year anniversary! I am from lexandria, live in Hong Kong, love decorating, traveling and Choinoiserie! Thanks for so many great ideas and colorful rooms. I always love opening the new entries to see what you've come up with! Appreciate the I tradition to Kerry Steele's fantastic art as well, she's terrific. I'd would happily choose one of her paintings! I had a look at all your sponsor's links and they all have somethings that I would love to own for my own home. Marye Kelley - The Union Jack Letterbox. Thanks I hope I do win, it would be so amazing! I follow the blog daily and also on Pinterest! Anything blue and white from Pink Pagoda, The map waste paper basket, and the Ming horse statue form Charlotte and Ivey. I recently purchased a pair of Chippendale chairs from them for my office. Congratulations on your 4 year anniversary! The items from Charlotte & Ivy are gorgeous! I love the skinny glass console! Congratulations on your fourth anniversary. Thank you for all your Chinoiserie inspirations! Oh, Beth! Your Pinterest boards are divine. I'm following you on Pinterest. Add to this, you've inspired me to create a board (ode to Chinoiserie Chic) for the contest give away. I love your blog and congratulations on 4 years of fabulous posts! Your blog always serves as an inspiration to me. I've tried to emulate many a vignette! I also follow you on Pinterist. Thank you for the amazing sharing you have done in your prolific four years of blog posts !!! I would love the sweet small ginger jar on the Pink Pagoda website! Happy Birthday, Chinoiserie Chic! My hands-down favorite blog! Congrats, Beth! Happy 4th Anniversary, Beth. Thank you for generously hosting this giveaway event. What a fine curator's eye you have. I love the inspiration boards you created for the Chinese Village home in FL. Gorgeous. All best wishes for many more years of blogging and designing. P.S. I follow you on Pinterest! P.S. I follow you on Pinterest!! THis is an amazing give away, you have outdone here!! Love all these vendors and so many items to choose its a difficult choice!! Will have to really wrack my brain! Great giveaway, so many gorgeous things!!! And I'm following you on Pinterest! Oh my, I have had such a good time window shopping! I'd love to have this waste paper basket. Thank you again for the giveaway. Happy happy!! It's been a fabulous 4 years! Here's to many more! *How* can I choose one favorite item from your amazing sponsors?? An impossible task. It's a tie for me between Pink Pagoda's blue & white canton ginger jar and Kerry Steele's brass ring Sunday painting. A girl can dream! Thanks for this giveaway! 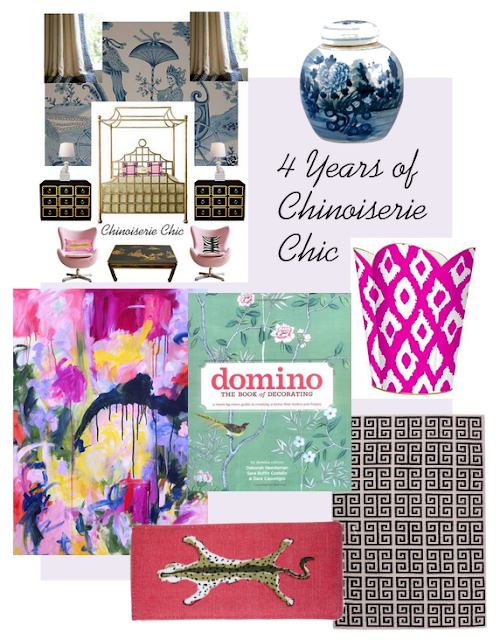 I love chinoiserie and love your blog!! Now I am off to check out the others and come back to tell you what I love. I am a regular of The Pink Pagoda and I love Jennifer's blog and work! PS...I also follow you on Pinterest!